Of course, it is. Nothing is impossible. The word itself says it: “I’m possible”. So if you have decided to travel while working on your online business, then that is great. Still, some travelling aspects can make it more difficult to keep well-organised. Here are a few tips for online business management while traveling. Depending on your place of departure and destination, it is important to always allow a time margin in your journey plans. Indeed, not all countries are so strict about punctuality. It is a matter of cultures and societies. For instance, as European countries are usually very punctual, Asian countries are much more flexible about it. Delays in flights and buses are very common there. Not to mention flight cancellations, which can be very common in some areas. Fortunately, you are entiltled to a flight cancellation compensation in this case. You can get this compensation for your cancelled flight with a company like AirHelp or other services of this kinf. Note however that it might not cover your business losses, if you miss an online appointment to close a sale for example. For this reason, it is important you always anticipate any delay that might arise during your journey. Again, depending on the country of destination, traveling with technology can be quite risky. For instance, burglars and pickpockets are very present in the major cities of South America. If you are checking your mails on your smartphone while drinking a smoothy in a juice bar and need to go to the toilet for example, never leave your phone on the bar, even if the waiter is there. One second of inatention can be enough for your phone to disappear. For this reason, we highly recommend you subscribe to an insurance which will cover all the tools necessary for the good management of your business, and back any data in the cloud to make sure you will always be able to get it back in case of trouble. Remember you still have to work, but you don’t have to be alone! Finally, keep in mind that whatever your destination is, even the sunniest, you will still have to work. 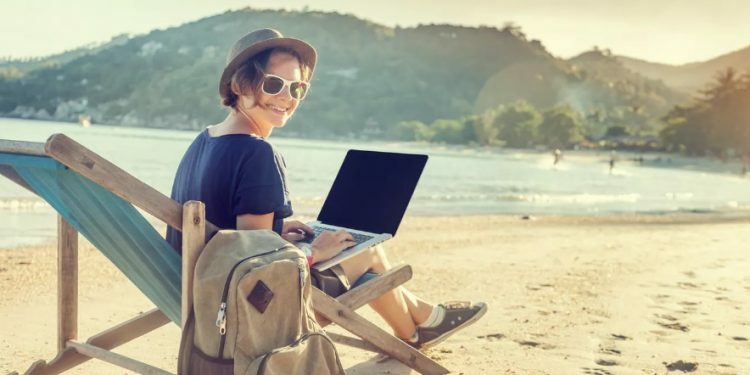 It might seem like a dream to go and run an online business while traveling in the most beautiful countries, however it won’t be much good if you are not well-organised and have to work twenty hours a day. On the contrary, it can be even more frustrating and lead you to loose your motivation very quickly. So always keep in mind that you won’t enjoy your destination as much as if you were visiting it on holidays. On the other hand, why not hiring an employee to help you? For instance, if you’re traveling to a developing country, you’ll probably be able to find cheap freelancers to support you in your tasks. This will allow you to explore the wonders of the countries you’ll while ensuring that your business is in good hands. You’ll also offer work to people who might need it more than others. A good deed is always rewarding!